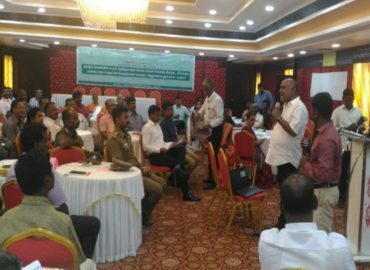 A District Level Participatory Workshop on ODF Sustainability was facilitated by FF on 4th November at Madurai. The workshop was organized to brainstorm, orient and sensitize all necessary stakeholders on the need and strategy to sustain the ODF status and draw a road map for such initiative. The participants in the workshop included the Collector, PD-DRDA, District Level representatives from all the departments including Rural Development, Health, Forest, Police and Revenue department. Representatives from State cell, SBM-G and UNICEF also participated in the workshop. There were 109 participants in the workshop.